Bahamas Paradise Cruise Line has grown its capacity by nearly 100 percent with Friday’s official introduction of the Grand Classica at the Port of Palm Beach. 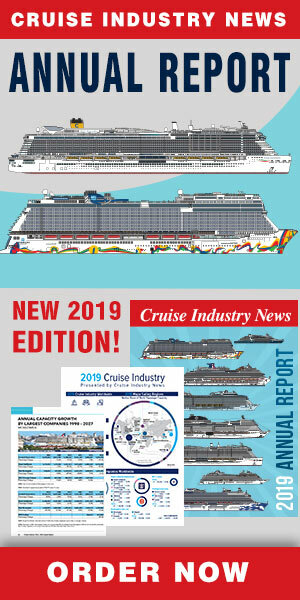 The company is led by Oneil Khosa, CEO; Kevin Sheehan Jr., president; and Kevin Sheehan, chairman, and the former Norwegian Cruise Line Holdings CEO. The new vessel is the former 1,300-guest Costa neoClassica and joins its slightly-larger fleet mate, the 1,500-guest Grand Celebration, in the unique two-night market out of the Port of Palm Beach. Offering two night cruises, the company also pairs them with land stays in the Bahamas, and is one of the largest contributors to hotel stays in the country. It announced late last year a three-year deal to continue calling in Freeport. The new Grand Classica underwent a major refurbishment in 2014. In October 2017, a comprehensive drydock took place to improve systems and infrastructure, complemented with refurbishments and improvements to ready the ship for the U.S. market. Eight dining venues include The Yellow Elder, the main dining room; Admiral’s Steak & Seafood; The Rock Grill; A Slice Above; The Grand Café; The Crow’s Nest Sports Bar & Grill; The Ocean View Buffet and Room Service. In addition, the Florida-based company recently made a number of improvements to the Grand Celebration, including a new adult-only area, a revitalized casino, and specialty coffee and juice bar. Bahamas Paradise will be the only cruise line to offer daily departures to Grand Bahama Island from the Port of Palm Beach becoming the largest provider of tourism to the Island, the cruise line said.